Get me a Porter — Stat! Somebody call me a porter. No, I mean get on the phone and order the best-tasting porter in the world. I’ll give you a tip on how to get started … dial 5 1 2. Not only is 512 the area code for Austin, Texas, but it happens to be the name of (512) Brewing Company, crafters of the greatest porter ever made. Of course, they have a huge advantage over other porter-makers out there. Their not-so-secret ingredient, the pecan, was falling off the tree right outside the brewery’s front door. So they added it to the mix, and voila, the (512) Pecan Porter was born. Pecan trees are plentiful in Texas. It is the state tree, after all. But what the brewers at (512) do with it is special. And it’s not just pecan pie in a glass, though that sounds pretty darn good. The Pecan Porter from (512) is a perfect blend of sweet pecans, dry malts, and just enough hops to balance it all out. The beer definitely ranks toward the sweeter side of the beer spectrum, but it isn’t what I would call a desert beer like the Southern Tier Crème Brule. No, it’s more for enjoying before, during, and after the meal. In fact, everything from (512) Brewing Co. is delicious any time of day. Two weekends ago, we visited the brewery for a tour that began at 11 a.m. – the perfect time of day to start enjoying their porter, IPA, alt, and pale ale, which happened to be the four on tap during our visit. 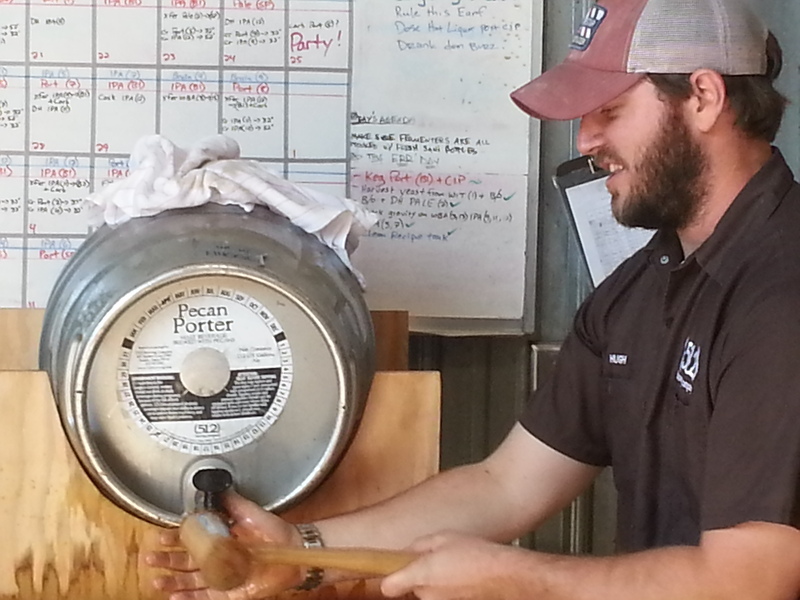 Hugh works hard to get the firkin barrel open. Check that, there was also a nitro Pecan Porter on tap, which tasted almost like the regular version, but with Champaign bubbles added. And at the end of the tour, or host Hugh pounded a tap into a firkin barrel of the porter, which had a more earthy taste than the standard version, most likely because of its fermentation process. One of my favorite porters from the past was the Honey Porter that Sam Adams used to make about 20 years ago, and then stopped for some reason. Or at least I can’t find it anywhere. So when I visited the brewery in 2005, I filled out 14 comment cards asking what happened to the honey porter. I guess I should have filled out a few more. Another one I can’t seem to get often enough is the Elementary porter from Three Brothers Brewing Company. That beer is so good, I filled a growler of it last year and drove it from Virginia to Texas and gave it to my Dad as a Christmas present. Upon tasting it, he promptly forced everyone in the room to have some, including my then 17-year-old nephew. Way to go, Dad. If you ever find yourself in Austin, be sure to make a trip to (512) Brewing Company for the tasting tour. Perhaps the best part about the entire tour is the approach the employees at (512) have toward everything – drink more beer. Oh, and try the Pecan Porter … it’s the best porter in the world. Deacon Don once said to me, “the road to hell is paved with good intentions.” I know he wasn’t the first person to say that, but it was the first time I’d heard it. And, of course, it came immediately after I apologized to him for failing to do something I’d promised. Nice guy, that Deacon Don. Well, the brewery crawl in Washington, D. C. last Saturday was also paved with good intentions. Instead of making it to five breweries that afternoon we made it to … one. Well, one and a half. And we finished the day at a pub that had about 150 craft beers on tap and another 300 in bottles. So that counts, right? At least the extremely unofficial brewery crawl started the way it was planned – with a trip on the train to Bluejacket brewery in Southeast D.C. near the once again prematurely quite Nationals Park. And if there was one place to go (no, not National Park) it was Bluejacket. 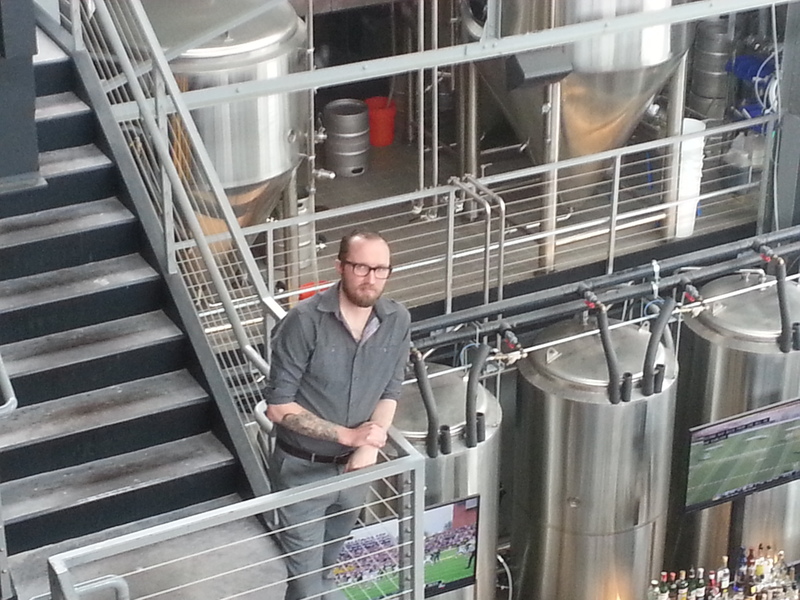 Ladies and gentlemen, here’s Ryan, our Bluejacket brewery guru. First of all, the brewery had 20-something of its own beers on tap. Now, often a brewery that has a high quantity in variety is trying to make up for a low quality of the beer. To demonstrate how it works the other way, consider Franconia Brewing Co. in McKinney, Texas. It has only has three beers on its rotation – a lager, a dunkel and a hefeweizen. But if you want the best true Bavarian-style beer west of Texarkana, then Franconia is your brewery. But Bluejacket didn’t follow the typical quality-quantity mold. Of the beers our little group of three then six beer pros sampled that afternoon, none were poorly made. Oh sure, there were some that might not have been in our flavor palate such as the sour beer for me or the rum-aged something for Matt. But even those we could tell were like every piece of cooked meat in Oklahoma – well done. We arrived right after the 2 p.m. Tasting Tour had begun, so we had no choice but to sign up for the 3 p.m. Tour, find a seat at the bar, and prepare for the next tour by enjoying some of the brewery’s finest offerings. For me, it was the beer called Mexican Radio – a superb tasting stout that Bluejacket describes as spiced and sweet. I could definitely taste the sweet milk chocolate and a hint of vanilla in this well-balanced imperial stout. I did not taste the Ancho chilies that the descriptor claimed it has, which was fine by me. I’ve never cared for smoked or spicy beer. My IPA-chugging companion chose to begin with the Spectre – an American IPA that had just a hint of citrus and white wine to counterbalance the relatively mild hoppyness (46.5 IBUs) of its IPA foundation. While my friend usually prefers her hoppyness about twice that much, she was highly complementary of the Spectre. The large format Darling Buds Mosaic — a wet hop pale ale. By the time 3 p.m. rolled around, we were joined by friend Matt and three others on the Tasting Tour. Our host, tour guide, and all-around good guy, Ryan, provided the perfect combination of beer knowledge, good humor, and plenty of tastes of their beer. In total, we got to try five different concoctions from the brewery – an IPA, a Porter, a Sour, a Lager and a rum-aged Brown Ale (at least, that’s what I think it was, but after five generous tastes, who can really tell … but I know it had rum). As previously mentioned, each beer was extremely well made. The lager was one of the best I’ve had, with a full, rounded mouth feel that reminded me of the excellent Vienna Lager from Community Beer Co. in Dallas. The porter was so good, every single person on the tour liked it – even the IPA chuckers in the crowd. The sour was a huge hit with everyone in our group who preferred that style of beer – which was one person. An hour later, we’d seen every fermenter, cask, mash tun, barley bag, yeast lab, storage locker, and refrigerated room of this multi-level warehouse-turned-brewery. We really couldn’t have asked for any more. But Ryan was kind enough to raise the bar (get it? 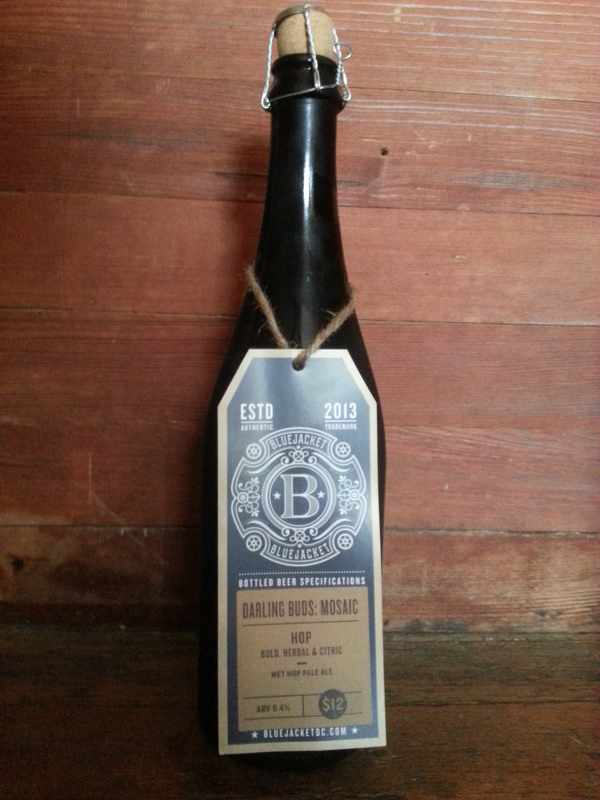 ), and handed us a large format bottle of their Darling Buds Mosaic – a wet hop pale ale. And if you want to know what “wet hop” means, just ask. I know because I’ve been on the Bluejacket Tasting Tour. About once or twice a year, my IPA-swilling friend and I have been known to create our own pub crawls. Typically we use public transportation to hit four to five different pubs, have a taste or two of the beers they have on tap that the other places don’t, then finish off the day with dinner out – a burger for me, of course. This coming weekend we’re taking it one step further. Announcing the entirely and extremely unofficial D.C. brewery crawl. First, take the Metro from our Dupont Circle area lodging to Bluejacket brewery located in southeast Washington between the Navy Yard and the now empty until next baseball season Nationals Park. Bluejacket has free tours at the bottom of the hour starting at 10:30 a.m. But our goal is to get in on the 2 p.m. tasting tour (there is a $29 fee per person) that has a behind-the-scenes view of the brewery and five tasting pours, including one from a barrel. How could we pass up that? Next it’s back on the Metro to head north toward 3 Stars Brewing Co., which is just a few blocks from our train stop. I’ve got my eyes on three of their brews – the Southern Belle brown ale, the Winter Madness winter warmer, and the Pandemic Porter, an American Imperial porter. I’m pretty confident that in the future the Pandemic Porter will be the mandatory preventative to curb the spread of Ebola. From there we walk a little over a mile to Chocolate City Beer, where I will tell them the importance of updating one’s website. While the brewers and/or webmaster at Chocolate City are saying on their site that they’re ready for spring, the rest of us are pulling out our long-johns because we know cooler Fall and Winter is what’s up next. And because the website needs a refresh, here’s hoping the beer offering this weekend has also been updated. Check back next week and I’ll let you know. DC Brau Brewing Company. The reality is the last three are all within about a mile and a half of each other — walkable for us, or an easy cab ride if necessary. I am sure my hoppy half’s eyes will light up when she sees On the Wings of Armageddon, an Imperial IPA that the brewers claim has an “intense hop character.” For me, the Penn Quarter Porter looks to be up my alley, though I’m willing to take a chance on the mystery beer that is the current “on-tap draft-only release.” And speaking of alley, DC Brau makes a point of mention on its website that the brewery is it located behind the post office and “you will need to go down the alley and turn right.” Roger. After that, it’s a manageable walk and then another train ride back to our Dupont Circle headquarters for either dinner or a place to quietly pass out. My mom is a burger Luddite. Well, sort of. That doesn’t mean she prefers to eat burgers by candlelight. That would make her burger Amish. No, she’s more Luddite. You know, that leaderless movement of passive resistance to consumerism and the increasingly bizarre and frightening technologies of the Computer Age. At least that’s what their manifesto says they are. Yes, mom wants her burgers plain and simple. Basically, meat and bun. I’m not even sure if she goes for the L-TOP, my shorthand for lettuce, tomato, onion, pickle. Though the last time we had a burger together – which is, of course, the most special of mother-son bonding moments – I think she went LT-O, as in lettuce, tomato only. And definitely no cheese. Cheese is right out. What to put on your burger might be one of the only things my mom and I don’t just naturally agree on. After all, great minds do think alike. The grill at Jack Brown’s gets crowded with its variety of burger concoctions. Case in point: I’ve corrupted my partner in crime so much that she craves a good burger about once a month. Comparatively, my burger requirements are typically one every two weeks, so she’s not quite at my level … yet. In terms of being a burger aficionado, let’s say she’s a burger yellow belt. So when we went to Jack Brown’s – a burger joint in Harrisonburg that is well-known up and down Virginia’s Shenandoah Valley – she told the watron that she wanted the day’s special, The Greg Brady burger, which comes with mac ‘n’ cheese and potato chips on top. But, she wanted (gasp!) the chips on the side. Being a burger black belt, I, of course, knew to trust the burger chef and ordered mine with the chips on top. Two minutes after the burgers arrived, she tasted mine and realized the error of her ways. I immediately gave her a field promotion. She’s now a burger brown belt. Now, some restaurants try to put too many things on top of their burgers. These are simply efforts to try to “trick up” the burger, and are usually just a ploy by a chain restaurant to make a tasteless burger taste better. A real burger joint – not a chain restaurant – doesn’t need to trick up its burgers. They’re simply making delicious burger concoctions. To put it another way, efforts to trick up a burger are akin to what today’s college football teams are doing to their uniforms. Just because you “candie up” your uniform – to quote my friend Gaylon as he channels his inner Darryl Royal, the legendary Texas football coach – doesn’t make you a better team, nor a better university. You can’t buy class. So the chain restaurants found in Generica with their “Double Wheezy Fresh and Cheesy” burger don’t cut it. You’ve got to go to a real burger joint, order a real burger, and eat it however it’s prepared. I’ll say it again – always trust a burger chef. Here’s another example. Both Jack Brown’s and Local Chop & Grill House – the excellent restaurant and bar that is literally (and unlike most people under the age of 20 I’m using that word correctly) 210 feet from our front door – have burgers dedicated to those who like their mouth lit up like an Aggie bonfire. (For those of you who don’t know, the Aggie bonfire is a pile of logs about 12 stories high that would be torched the week Texas A&M played Texas in football.) In other words, the burgers are a bit on the spicy hot side. But both have drastically different ingredients. 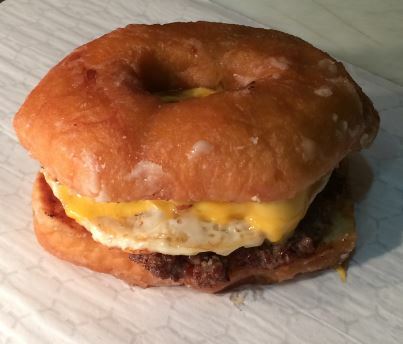 A burger with a donut for the bun. Yes, you can find that at Jack Brown’s too. Jack Brown’s has the Shocker, ground beef topped with fresh jalapenos, fresh habaneros, pepper jack cheese, and shocker sauce, a closely held secret in-house creation that is guaranteed to set your mouth (and later your pants) on fire. I’ve had them both. Each is outstanding. And even though the toppings are different, the results are the same – an enjoyable, delicious burger that makes you appreciate that God had a sense of humor when she gave us edible things like habaneros. These burgers were so spicy, this transplanted Texan loses 5 pounds in sweat each time I have one. Each is so hot that my friend Melanie, who drinks the hottest sauces in the world like the rest of us drink water, might even release a bead of sweat. But they’re also so delicious, it’s worth it. And hey, it’s better than going to the gym, right? Most importantly, they taste great because the burger chef knew what he was doing. 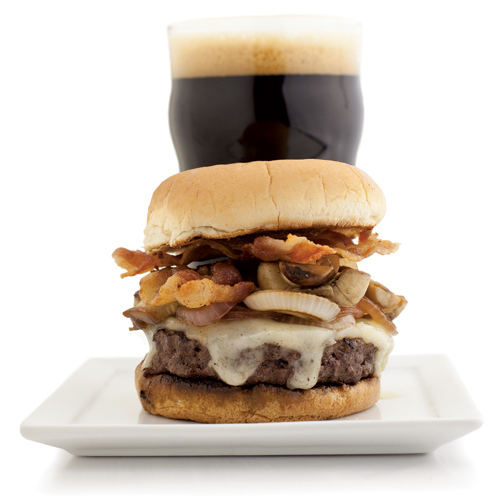 He picked the ingredients that he knew would taste great together, and cooked the burger with that in mind. And my point is, that’s what we all need to keep in mind. Whether you’re a purist or an adventurer, always trust the burger chef. CODA: My hot sauce slurping friend Melanie has a great blog on wine. If you’re into that sort of thing, check her out at DallasWineChick.com. CODA CODA: Thanks to Lisa at Jack Brown’s for the burger photos. 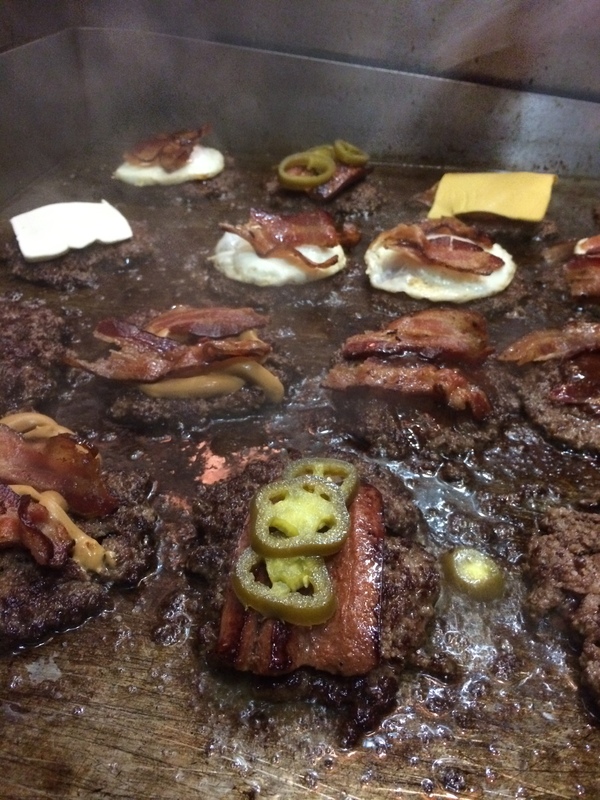 This entry was posted in Burger related and tagged burger place, burgers, chef.